I HEART BACON – Page 35 – Seattle & LA-based food blog with recipes, restaurant reviews and all things bacon. 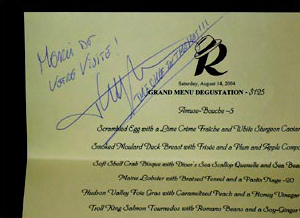 Ever since my mom and I saw Thierry Rautureau speak at the 2003 Cascadia Culinary Arts Conference, we’ve been wanting to eat at his restaurant. He was so personable, funny and well-spoken. I loved hearing about his childhood food memories and about the importance of supporting local, sustainable farmers. So when my employer gave me a gift certificate to Rover’s as a going away present, I knew who I had to take. I called my mom to pick a date and then booked the reservation. We splurged and both chose the Eight Course Grand Menu Degustation ($125). I have never been, nor will ever be a vegetarian, but even the Five Course Vegetarian Menu Degustation sounded amazing. We asked for a white burgundy and our waiter presented us with a 2000 Meursault les Clous Bouchard Pere & Fils (mmmm). Amuse-Bouche: A trio of Ginger Carrot Soup with Basil Oil, White Cheddar Puff Pastry Twist & Rabbit Mousse – A wonderful sip of soup with a crunchy puff pastry cracker. The mousse was delicious and came on what my mom dubbed ‘the communion wafer’. I could have eaten spoonfuls of the rabbit mousse, but since it was an amuse-bouche, it was about the size of my fingertip. Scrambled Egg with a Lime CrÃ¨me Fraiche and White Sturgeon Caviar – Heavenly caviar mixed with just the right amount of perfectly scrambled egg, stuffed back into an egg shell and set in an egg cup. Beautiful. Smoked Moulard Duck Breast with Frisee and a Plum and Apple Compote – Rich, smoky duck breast slices paired with a sweet compote and presented on a crisp frisee salad. Soft Shell Bisque with Diver’s Sea Scallop Quenelle and Sea Beans – One of my favorite dishes. A rich tasting broth with beautiful and light quenelles. The standout ingredient in the dish was actually the sea beans—crunchy little morsels that burst with a sweet and briny flavor. Maine Lobster with Braised Fennel and a Pastis Nage – Another favorite. Perfectly cooked lobster that was actually tender, served in a wonderful licorice broth. Hudson Valley Foie Gras with Caramelized Peach and a Honey Vinegar Gastric – My absolute favorite. 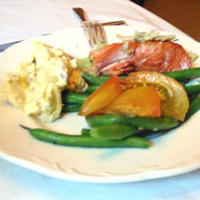 The plate came out and it looked like a painting, swathed in red and orange hued sauces with bright green accents. An amazing piece of foie gras that was made even more wonderful when paired with the rich sauces. The portion was so large that I almost couldn’t finish it, but of course I did finish it. Troll King Salmon Tournedos with Romano Beans and a Soy-Ginger Glaze – This was good, but after all the fantastic things that preceded it, this ended up tasting somewhat plain—like a really good salmon teriyaki. Sauvignon Blanc and Peach Sorbet / Black Tea with Silver Honey Sorbet – The peach sorbet was too sweet and cloying for my taste and the tea and honey sorbet had a very odd tangy flavor. Roasted Lamb Loin with Zucchini, Onion Confit and a Moroccan Olive Sauce – This was good as well, but in my opinion, the most interesting dishes were all the seafood courses. European and Local Cheese Assortment – All excellent cheeses and I can’t remember the name of a single one of them. Symphony of Desserts – A trio of really beautifully presented mini-desserts, but they looked better than they tasted. Jellies & Truffles – A nice assortment of chocolate truffles and jelly candies. All in all, the dinner was amazing—beautiful presentation and interesting and delicious ingredient parings. However, I do think that the eight course menu may have been a tad bit too much food for me. Next time I go back I will order a five course menu and request mostly seafood. Months before the party, I started my online research. Most sites recommended burying the pig in the ground, but my mom’s place has a septic system, so I quickly ruled that method out. Next I looked at spit roasting but reconsidered after reading horror stories of pigs falling off their spits and being engulfed in flames. When I came across the Three Guys From Miami method I knew I had a winner; it was easy, safe and (relatively) cheap. The next step was to send out invitations and figure out how many people would be attending. My friend Zach made a beautiful invitation, which apparently no one bothered to read. After calling everyone because only 2 people RVSP’d, I estimated that 25-35 people would be attending and I was ready to reserve a pig. 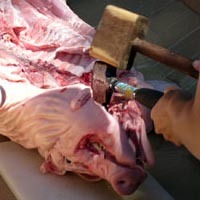 I wanted a quality pig, so I called Don & Joe’s Meats on what happened to be the 4th of July. Me: Hi, I’d like to order a pig. Me: I am calling to pre-order. D&J: Oh. [Long pause.] Okay, what size do you want? D&J: How do you want it prepared? D&J: We can butterfly the body but not the head. Me: Why not the head? D&J: Our bone saws break when they go through teeth. 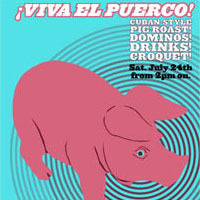 The day before the party, we went down to the Pike Place Market to pick up the pig which was, thankfully, packaged in a box; I didn’t need to lose my nerve just yet. I was giddy and dancing around while the butchers laughed and helped me load it into the truck. After we got up to Whidbey, we opened up the box and were slightly terrified. 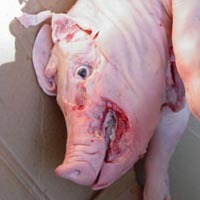 The pig was bright, bright pink with a trail of blood dripping from his mouth. He belonged in some sort of B-grade horror movie. My friend Kait likes to dissect things so she made swift work of splitting the head while I made the mojo. We slathered the pig in the marinade, wrapped him in plastic and a tarp, deposited him in the bathtub and topped him off with ice. Per the TGFM method, all we had to do was find some cinderblocks, some pieces of metal, and someone who can weld. Luckily, I know a lot of artists who work in metal. We headed over to a friend’s house, who graciously let us use her welding shop. Kait, again to the rescue, with her (slightly rusty) welding skills. It was a miserably hot day and every minute that passed felt like an hour. When we got back to the house we found a nice, large flat spot in the front of the house where we arranged the cinderblocks. My mother over-worries things and became convinced that the heat from the oven would cause an underground fire and the whole property would go up in flames. I humored her by watering the dirt around the area for about 15 minutes. 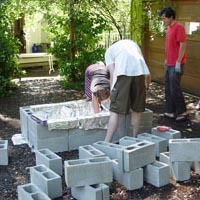 Then we covered the cinderblocks in tin foil to make a giant oven. The day of the party was another blistering hot day, so lighting the oven was not fun. I got the coals started in the Weber, then I miserably transferred them to the corners of the oven, one small shovel-full at a time. It was hot, hot, hot. 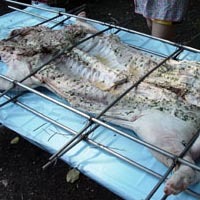 We strapped the pig into the frame, ceremoniously laid him on the oven and tucked him in with foil. Time for cocktails. 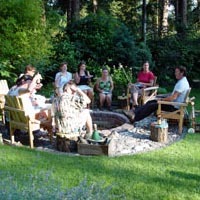 Kait and Zach made some great Mojito’s and we kicked back and waited for the guests to arrive. 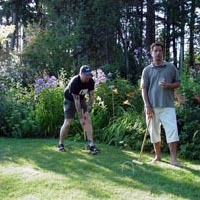 It was actually so hot that day that no one could leave the shade, which made playing croquet in the full-sun back yard out of the question. 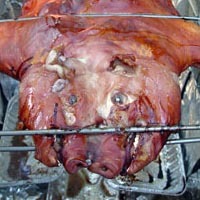 So we all hung out in the shaded front yard, drinking and watching the pig cook. 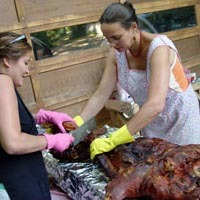 After four hours the pig was up to temp and we unveiled it. It was a beautiful sight. 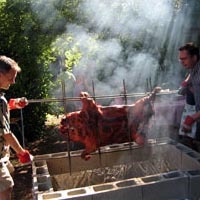 The skin needed a little more crisping but the meat was already cooked, so with the help of half the party we took the pig off the oven, spread out the fire and removed three layers of cinderblock so that the pig was just inches from the coals. Another 30 minutes on the coals and the pig was perfect. Getting a sixty-pound pig onto a carving board was way trickier than I had anticipated, but again, with lots of help we got it off the rack and onto the table. I donned my pink plastic dish gloves, picked up a cleaver and went to town. I probably had a few drinks in me by this point and I have to say that I’ve never had so much fun carving up a piece of meat. The end result? The meat was good and tender, but not the falling-off-the-bone tender you’d get from burying the pig and slow roasting it for 24 hours. I also wasn’t wild about the marinade—it seemed too citrus-y and I think it may have pre-cooked the meat a bit too much. Next time I’ll try a more savory marinade with lots of salt, garlic and sage and cook the pig in the same method, but over a much lower heat and for a longer period of time. Everyone else brought some really great Cuban dishes, but the standouts were Kait’s Black Beans and Kathy’s Coconut Bread. We finished off the meal with a delicious caramel dessert that I first heard of at The Pink Door. It sounds crazy and a little trashy, but the only ingredient is sweetened condensed milk. We topped the caramel with fresh whipped cream and toasted walnuts—it was fantastic. 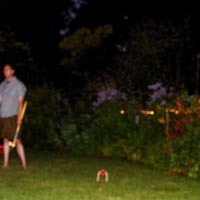 After we recovered from eating too much food, we played croquet by torchlight way into the night. A few of us die-hards stayed up even later playing dominoes and finishing off the rum. It was the perfect way to spend a hot Seattle summer weekend. I always had this childhood fantasy that I would marry the person who first took me to Canlis. As it turns out, my mom took me for my 31st birthday. The restaurant was beautiful with an amazing view, but horribly quiet and empty (of course, it was a Monday night). We split the foie gras and Dungeness crab leg appetizers, which were both fantastic. I ordered the $70 Kobe beef steak on recommendation from the waiter. It was good, but $70 good? Probably not. Mom had the duck and we split some desserts. Overall, the food was quite good, but also really simple. 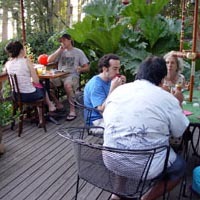 I think for as much money as was spent, I prefer ‘fancier’ food and a more engaging atmosphere. As we were leaving, we peeked into the piano bar area and I realized that this is where we should have been—lounging in the bar, drinking cocktails and eating fantastic appetizers. I’ll be back for that. With or without a man. I learned something very important today; don’t run barefoot in a field full of clover. I also learned that putting tobacco on a bee sting relieves the pain. Sort of. My mother has a friend that loves ravioli. He loves them so much that she decided to throw him a 5-course dinner party—with every course being a different ravioli. A few of the guests came over early and helped us roll the dough and form the ravioli. I was in charge of making the sauces and some of the fillings. 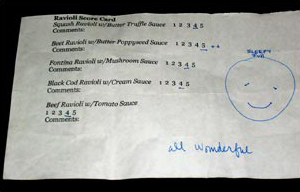 I had the bright idea of making scorecards so everyone could rate the ravioli. And I was obsessively diligent about making the guests fill them out. At the end of the night, the results were a shocker. I was expecting so much more from this recipe since I LOVE Lumiére, but this was just boring to me. I much prefer my Sweet-potato ravioli recipe. A really simple filling, with not many ingredients or spices. It was surprisingly flavorful, considering. Very light and delicious. My third favorite. I once had a wonderful Fontina Val d’Aosta ravioli dish at Brasa, so this was my attempt to recreate it. This was probably my favorite. The ravioli were cheesy pillows that burst with flavor when you bit into them and the creamy porcini sauce was a rich foil. 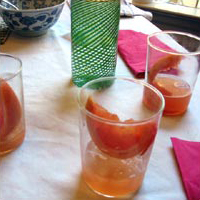 My second favorite; mom and I have been making this recipe for years. The filling is a wonderful, delicate mousse and the cream-based sauce is very light. This was an adaptation of my Grandmother’s ravioli recipe (minus the sheep brains). It was good, but seemed unsophisticated compared to the other ravs. My least favorite. After dinner we walked across the street to the Seattle U campus and I showed Zach the church where my friend did an installation. It’s so beautiful and it smells like honey. Then we had dessert at Supreme where we had an amazing berry semifreddo [which prompted a summer-long obsession with them—this is my favorite one so far]. The semifreddo was served with a great and unusual chilled, sparkling dessert wine: Marenco Pineto Brachetto d’Acqui ‘03 [haven’t been able to find in Seattle yet…]. It was a very good night for food.